The temperature has dropped here in San Francisco, and it is starting to feel like Fall. Our little Indian summer went by too fast, and it seems like the cooler weather is here to stay. As a result, I have been obsessed with making soups lately. I apologize in advance for the abundance of soup recipes I will be posting on here in the next few weeks! For me, there is nothing better on a chilly Fall day than a warm cup of soup. 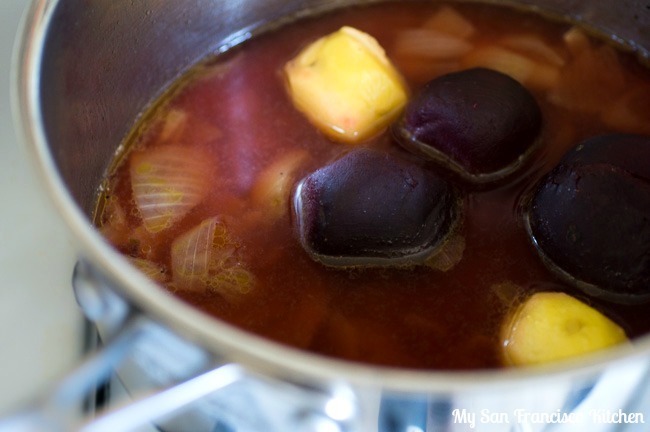 One of my favorite soup recipes to make on cold days is this beet soup. My husband doesn’t like beets very much, but I always buy them because they are really healthy! I try to sneak them in salads, but the other day I made this creamy beet soup with them. I found the recipe in Cooking Light magazine, and after I tried it once I was sold. I love the texture that the potatoes add to this beet soup – you don’t need any fattening heavy cream. 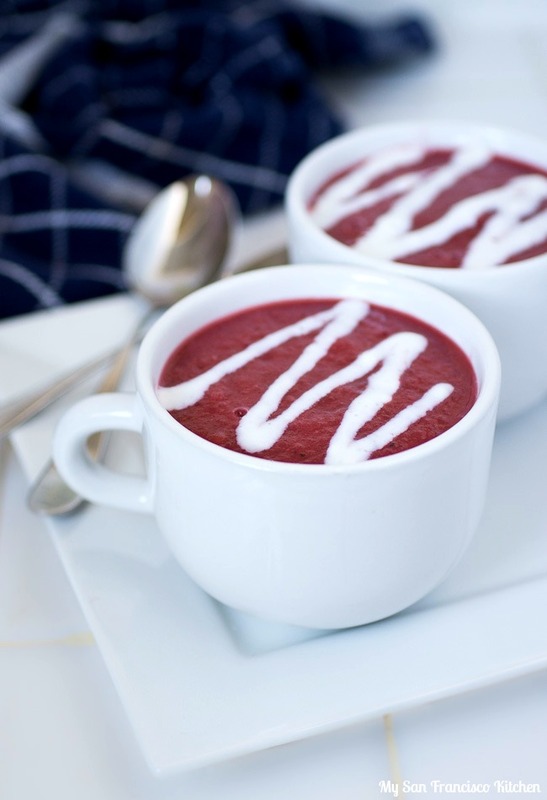 The sour cream drizzle is easy to do, and gives your beet soup a finished look. Sour cream pairs very well with this soup! I use a plastic squeeze bottle and add one part sour cream, one part milk and shake it up. It pours out easy, but slow enough for you to make lines over the soup. Get creative and make an elegant design with it! Hooray, the weekend is almost here! On Saturday we are going to a Baby Shower, and Sunday just planning to relax and hang out in the city. Also, my baby girl is turning 5 months old – where is the time going!? Heat the olive oil in a skillet and add the onions. Cook until soft, about 7 minutes. Add the remaining ingredients, except for the sour cream and milk, and bring to a boil. Cover, lower the heat and simmer for 20 minutes until potato is soft. Bring to room temperature and purée in a blender until smooth. Add the sour cream and milk to a squeeze bottle and shake well. Drizzle over the soup before serving warm. 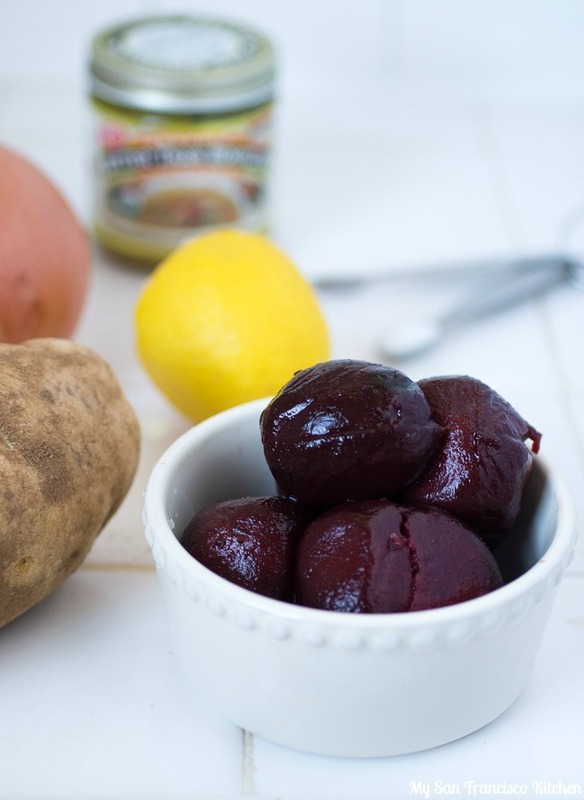 This entry was posted in Soups, Vegetarian and tagged beets, fall, healthy, soup. Great recipe especially with beets in season and easily veganizable. Soup is perfect for chilly weather, thanks! I’m jealous you are in Spring now! Wow, baby already 5 months old… that can’t be true. Life is rushing all of us on. But isn’t it a bliss for being able to enjoy such a delicious soup? My husband is not as fond of beets either but I guess he will love the onions in it and that wins him over easily.